(1963, B&W, Sci-Fi, Horror, Monsters) Monsters invade Los Angeles and a small band of people must fight for survival. Yes, these kinds of movies were made decades before the zombie craze started lumbering about. YouTube (1h 37m) First aired on or around December 30, 1989. "After Los Angeles is invaded by an army of subterranean monsters a small group of people must fight for survival in the deserted metropolis." Starring Robert Hutton, Les Tremayne and Robert Burton. A bit more of a write-up will come later, and we'll have the viewing sometime next week. As for the episode... well, it'd have been nice to come back to a more memorable episode, but we're still in the first season after all. Next time though, it'll be Project Moonbase. It's based off of a Heinlein story, and one of the funnier first season episodes. Radar men from the moon is difficult to get through. One solid hour of laughs as prehistoric creatures resembling rotten vegetables emerge from a sewer and take over Los Angeles. The monsters "from the bowels of the Earth" terrorize the tiny cast led by Robert Hutton. With Susan Hart, Les Tremayne, and Tom Laughlin. Though we ended up hating Commando Cody, it was fresh to us in those days and the writing team began laughing to distraction when Cody's partner hid in the bushes and someone said "I'm a little fuzzy rabbit, come and find me. I'm so naughty." Well... it was funny, and you have to remember it was a very small room with almost no ventilation. As for The Slime People, funny as it was, I wish we could do it again with a full staff of writers--it is a perfect movie for us. It's interesting to note that the silhouettes were green on this particular show. This was because certain people at the Comedy Channel felt that audiences just wouldn't get what was going on and they needed to have their eyes drawn to the silhouettes to figure it out. It looks really stupid. Pre: Joel and Servo cringe at Crow's morning liveliness. Invention Exchange: Cartoon Character Goggles and Screaming Cotton Candy. 1: Commando Cody is put on trial. 2: The bots fail to figure out the movie. 3: The guys think of disgusting ways to describe the slime people from the movie. End: Joel bakes a pie. Woo! Super excited to get to do this again. When would be the best time for people to see this? I'm between jobs, so I could really do this whenever. In the past it's been Thursday or Friday evening Eastern time. This week I'll probably be missing if its on Friday night, but I could do a reasonably early time on Thursday, or we can just keep it Friday at 8 eastern like we did before and I'll be back next week. You're the first to respond, and I have no problems with Thursday. Anyone have any timing objections? the tiny cast led by Robert Hutton. With Susan Hart, Les Tremayne, and Tom Laughlin. Wait... Billy Jack Tom Laughlin?? Checking the imdb, it looks like a simple case of name collision. The Slime People is not listed under that Tom Laughlin's acting credits. On further investigaton, the name Tom Laughlin is not mentioned on IMDB's credits for The Slime People. Maybe it's an error in the Psychotronic Film Guide, or in the IMDB's database? The plan is to have the showing tomorrow at 6 PM Eastern time. Considering the issues that got in the way of having showings the last time appear to have been alleviated, we're going to use a share video room again. As before, the actual show will begin some time earlier, rolling through 6 PM with an assortment of Mystery Science Theater-related amusements and other things. A link to the room will show up here tomorrow (Thursday) when the room opens, and I'll inform everyone in Chat when it starts up. Later showings might use different sites. Hobgadling pointed out one in particular that might be useful, but I haven't had opportunity to test it. It allows for syncing videos that aren't on YouTube, but has the issues that everyone has to have a copy of the video ahead of time for it to work, and it only works on MP4s. The requirement to have everyone download the video first is probably too onerous, especially since I can't currently afford the web space I'd use to distribute it. Plus, its looking like that site uses voice communication for its chat facility, which I'm thinking may chase some viewers off. However, there are a few MST episodes which are unavailable on YouTube and are unlikely to show up in the future, and some alternate means of showing will be needed when we reach them. I missed this but I'm in! I may not be there right at 6, but I'll be there too. I'll try to make it too. Thanks for doing this, JHarris! Starting the pre-roll now. If you can't make it at 6, the movie itself will probably cycle through at least once before then. Movie is about to start, at the above URL. Thanks again for setting this all up! Written by Robert Heinlein, set in a future where, on the plus side, women are reporters, high-ranking military officers and even President. On the negative side, the writer seems to actively hate them, and even gives them demeaning names. The reporter is named Polly Prattles, and our heroine, Colonel Breiteis, as in, "Bright Eyes." If this sounds awful, well, you ain't heard nothing yet. Let's just say, among other things, the poor Colonel is subjected to being threatened by a general with a spanking.... The first episode where the guys seem to be actively offended by the movie. Word is that this is also the first movie they did that was actually a failed TV show that was strung together to make a movie, although unlike The Master/Master Ninja, this never made it to air as a show. A personal favorite of mine, and a good one to jump in on. It's after the apocalypse... they tried to get to the power station... but no one was prepared for the -- Robot Holocaust. According to pre-existing measures Robot Monster was the worst movie the MST guys had ever done (and by those measures, still is), but this one is easily its equal I think. While also a little offensive in places, this is a grand bad movie, with terrible sets, horrible writing, awful acting and even a dumb premise. The movie looks exactly like a bunch of LARPers decided to film their shenanigans in Central Park and call it a movie, and it means it ties Robot Monster, in my opinion, for the title of best episode in the first season. Also: it's the first movie they did in color! And until City Limits, it was the newest movie they had ever done (coming out in 1987)! And it was released direct to video! With this film, we're finally easing out of the 50s-style super gray B&W films into the full breadth of bad movie they would cover through most of the show's run. Another color movie, and the first very sixties movie they did, made in 1969 presumably in the wake of the moon landing. It's a sci-fi flick set on a recently-colonized Moon. 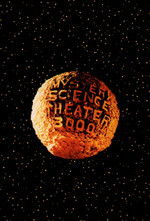 Its poster calls it "The first moon 'western,'" but that might be giving it too much credit. A "teensploitation" film starring Mamie Van Doren, a delinquent who's sentenced to work on a corrupt prison farm. A monster movie with stop-motion effects, this is another movie that for some reason didn't make a big impression on me. After those, we're out of the first season and ready to move into the awesome Season Two, with ROCKETSHIP X-M, then, brace yourselves, we run headlong into THE SIDEHACKERS and CATALINA CAPER, both top tier episodes. Joy! I keep forgetting this is happening. Well, with the exception of Robot Monster, there's not been a whole lot of good episodes so far. It's been diehards, completists, and random curious Chat users who have been involved so far. There's a reason few people mention first season episodes when they talk about their favorite shows, and why Best Brains themselves took the first season out of circulation while it was still on the air. Project Moonbase next week will be pretty good though. By the way, did you know that reruns of MST3K are back on the air?